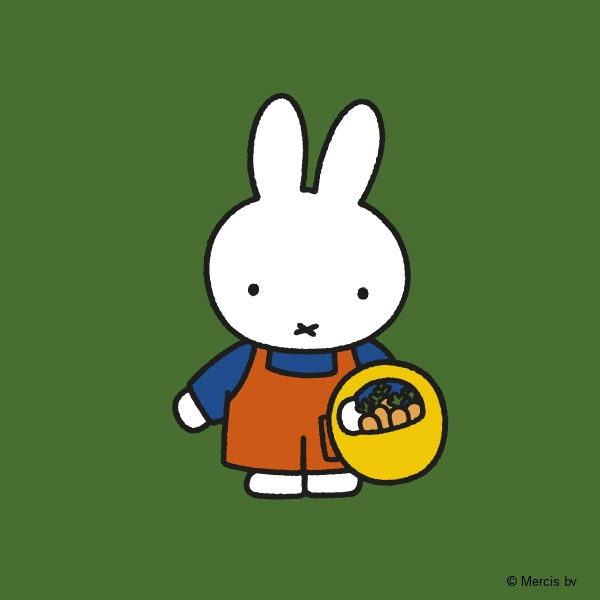 Miffy was taught to grow carrots by Father Bun and now she wants to teach you! Miffy loves to get her hands muddy outside in the garden. After all, what could be better than juicy orange carrots with beautiful luscious green stems? First, you need a place to grow your carrots – Miffy has a lovely sunny garden with lots of space – but not everyone is so lucky. If you’re growing short-rooted carrots then they can grow almost anywhere, so you can plant them in a window box or just a large container! Once Miffy has put on some red overalls and gone outside with her little spade, it’s time to get gardening! Miffy starts with the earth, first it needs to be turned over this way and that with a spade, which is hard work for someone who is young like Miffy, so Father Bun helps. Now the earth is ready f or planting the seeds. Miffy knows that even though the seeds are very small, she shouldn’t plant them too close together, and instead she just needs to sprinkle them on the surface 1.5 to 2 inches apart and gently tuck them in with a thin blanket of soil. Then it’s time for the watering can! Miffy has to be careful when she waters the plants as she doesn’t want them to be thirsty, but too much water can spoil them, so she just tries to make the soil damp. Once all this is done, Miffy checks on her little plants every few days to make sure that they’ve got enough water, and not looking peaky. And then, in as little as seven short weeks, they’re grown! And Miffy and Father Bun can eat them for dinner. Miffy has learnt from Father Bun that carrots are just like people and have things they like and dislike. Just as Miffy doesn’t like losing her teddy, carrots don’t like being too hot or too dry. They like ground which is well drained but damp, and they like cool air with lots of sunshine. 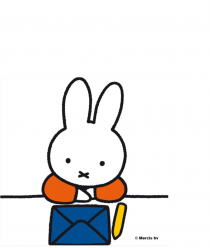 The more Miffy thinks about it, the more she notices all the things she has in common with carrots. Miffy loves springtime, and so do carrots. Just like Miffy, carrots are a friendly bunch, and they thrive when they’re grow up alongside tomatoes, chives, lettuce and even radishes! Carrots are good for you and contain all sorts of vitamins! Miffy knows this so she makes sure to always eat her carrots at dinnertime. After all, carrots that you’ve grown yourself are even more yummy than store bought ones! Why not help Miffy grow carrots with the miffy’s garden app? You can use the app to read miffy’s garden out loud as well as playing several games with Miffy including Make Your Own Garden and Counting Carrots. The miffy’s garden book has been re-released with updated texts and is available from Waterstones and all good bookshops nationwide.